One of the most unseen but one of the most important systems in your home is the sewer lateral. A quick review: A sewer lateral is the underground pipe that connects a residence to the sewer line. Generally, it is made of ductile iron at least 4 inches in diameter. Usually at least 50% of the line runs under the home, then exits the home and travels across the property to join up with the main sewer line. Unfortunately, the privately owned underground section of a lateral is often taken for granted until a problem erupts that can’t be ignored — such as raw sewage backing up into a dwelling.A number of things can compromise a lateral. Foreign substances or objects can sometimes create a clog. Tree roots occasionally push through the side of a lateral. 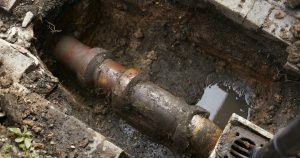 Or, over time, a very old sewer lateral pipe can simply corrode and crack. Usually the part of the line outside the home is covered by a municipal insurance program that most people pay for as part of their property taxes. The portion under the home is not and the repair or replacement of that section can be extremely invasive and costly. The process usually amounts to digging up the concrete floor and replacing all portions of the lateral line with a PVC pipe. It is messy, and costly ($3,000-$10,000). A past buyer client of mine and I were talking recently about some non-real estate related issues (as we have become good friends over the years) and she mentioned that she was planning on finally finishing her basement. The space is a perfect candidate for finishing – high ceilings, only one set of support posts down the middle of the open, bright space. Instinctively, I put back on my real estate agent hat and hoped to give her as many bits of advice I could. One thing that emerged was that she had not examined the condition of her sewer lateral since she purchased the home several years ago. I explained to her that sewer laterals don’t last forever and that it would be wise to evaluate it’s condition now as opposed to when the basement is finished because lateral replacement costs would skyrocket if finished flooring materials, walls, and other improvements needed to be demolished in order to gain access to the failed lateral line for replacement. She wisely took my advice and used a recommended lateral inspection company to view, videotape, and report on the condition of her lateral. As it turned out, the portion outside of the home (usually made of clay) was in fine condition (other than some minor tree root build-up), however cast iron portion under her basement floor was cracked and part of it had even collapsed, and failure of the line was imminent. She replaced her lateral for $3200 and then proceeded to finish her basement, disaster averted. While no one just loves to talk about sewer laterals, accepting that perhaps once a year every homeowner would be very wise to have it evaluated and video scoped to prevent clogs, backups (yuck), and complete failure. And by all means do so before you make improvements so that you can avoid wasting valuable time and resources.